So, this book. OH MY GOD THIS BOOK took me to a whole new place. 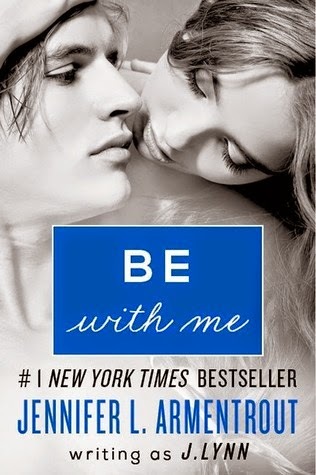 "Be with me" is the third book of the Wait for you series and is by far my favourite one. "Be with me" is a young-adult novel based on a relationship between Teresa Hamilton and Jase Winstead. Jase and Teresa know each other for a long time and both have an attraction for one another but they don't show it because Teresa's brother is Jase's best friend. One night, when Jase spent the night over at Cam's (Teresa's brother), they kissed, but they never told anyone because they were afraid of Cam's reaction and they thought it meant nothing, but it did mean something. It's been an year and somehow Teresa and Jase end up in the same Music Appreciation class to which they both share a disinterest in, which sets the foundation of a friendship. Teresa was a talented dancer who has suffered an injury in the past that incapacitated her to dance and to pursue her dance career. Even though Jase tries to win Teresa's trust and starts flirting with her, she doesn't show her feelings at first, even though she has them, but Jase keeps trying. Both Jase and Teresa have a difficult past that reflects itself in the present but Jase holds a big secret of his bygone that he never had told any girl. Will they overcome the difficulties? Will they be together? Well, I thoroughly enjoyed this book because of the story and because it made be think about my past choices and made me question "what if? what if i made a bad choice today that will change my whole life? What if it wasn't a bad choice at all?". This novel was definitely one of my favourite books, that not only portrays the concept of true love, but the strength to overcome your ghosts with the support of your friends and beloved ones. Jase and Teresa represent the prototype of a healthy relationship where they're not just together, but they are each other. They're reflected in themselves, they complete each other and they strive to overcome their relationship problems. I related myself a lot with Teresa, not only for her physical, but also for her thoughts, her emotions, her desires, her doubts and her convictions. Also, the book relates all the plot with the first two books, which I found really pleasant because I could follow as well the evolution of the characters and their relationship. I would recommend this book to every youngster because it is just fascinating and breathtaking. And I warn you, once you start reading it, you just can't stop. I was going to start a segment with my favourite quote, but I just can't decide myself on this one. I would choose the whole book!